Today, India is one of the bright spots among the major countries in the subdued global economic context. India recorded a growth of 7.1 % in 2016-17, 7.9 per cent in 2015-16, as compared to 7.2 per cent in 2014-15 and 6.5 per cent in 2013-14. Predictions by expert agencies suggest that India’s growth rate is set to improve further in 2017-18. In terms of the Global Competitiveness Index (GCI) prepared by World Economic Forum for 138 countries, India ranked 39 in 2016-17, as compared to India’s rank in GCI of 60 (among 148 countries) in 2013-14. A historic decision of the present NDA Government led by the Prime Minister Shri Narendra Modi was the withdrawal of the legal tender character of old Rs.500 and Rs.1,000 currency notes on 8th November, 2016.This resulted in curbing the menace of black money, corruption, bringing informal sector in to formal one resulting in wider tax base and above all, in digitization of economy among others. The fiscal situation of India has become comfortable, with Fiscal Deficit as a ratio of GDP steadily declining from 4.5 per cent in 2013-14. Fiscal deficit of the Government of India as a ratio of GDP was 4.1 per cent in 2014-15, 3.9 per cent in 2015-16 and 3.5 per cent for 2016-17 (Revised Estimate). The fiscal deficit is budgeted to be 3.2 per cent of GDP in 2017-18. The present Government took charge in May 2014 in the backdrop of persistently high Inflation, particularly the food inflation. Astute food management and price monitoring by the Government in the last three years helped control the stubbornly persistent inflation. The average CPI (combined) inflation declined from 9.5 per cent in 2013-14 to 5.9 per cent in 2014-15 and 4.9 per cent in 2015-16. It declined further to 4.6 per cent in the current financial year, upto February 2017 and stood at 3.7 per cent in February 2017 backed by sharp fall in food inflation. Food inflation based on consumer food price index (CFPI) which was in double digits during 2012-2014 declined to 6.4 per cent in 2014-15 and 4.9 per cent in 2015-16. It declined further to 4.4 per cent in the current financial year, upto February 2017 and stood at 2.0 per cent in February 2017. India’s Trade Deficit was highest at US$ 190.3 billion in 2012-13. However, it declined by 13.8 per cent to US$ 118.7 billion in 2015-16 which was lower than the level of US$ 137.7 billion in 2014-15. During 2016-17 (April-February), trade deficit decreased to US$ 95.3 billion as against US$ 114.3 billion in the corresponding period of the previous year. FDI Reforms: FDI upto 49% is allowed on automatic route in Defence Sector. 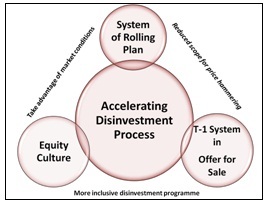 FDI reforms were also undertaken in the Insurance Sector (49% under automatic route instead of earlier up to 26%), Pension Sector (upto 49% under automatic route instead of earlier provision which stipulates up to 26% FDI on automatic route), Pharma (74% FDI is allowed on automatic route and beyond it to 100% on approval route), Civil Aviation (100% FDI is allowed under automatic route in Brownfield Airport projects), Animal Husbandry(FDI in Animal Husbandry (including breeding of dogs), Pisciculture, Aquaculture and Apiculture is allowed under 100% FDI even in uncontrolled conditions), Single Brand Retail Trading (Local sourcing norms has been relaxed for up to 3 years and a relaxed sourcing regime for another five years), Broadcasting Carriage Services (In Cable Networks (with MSOs and other MSOs), Teleports, DTH, Mobile TV, HITS sectors, 100% FDI is allowed on automatic route) and Plantation (FDI upto 100% is allowed on automatic route in Coffee, Rubber, Cardamom, Palm oil tree and Olive Oil Tree Plantations in addition to tea plantations). Inflow of Foreign Direct Investment increased from US$ 43.6 billion 2013-14 to US$ 51.8 billion in 2014-15 and further to US$ 59.5 billion in 2015-16. During 2016-17 (April-December), net FDI was US$ 31.2 billion as compared to US$ 27.2 billion in 2015-16 (April-December).The FDI in India during 2016-17 was highest in the world, even higher than in China. India’s external sector position has been comfortable, with the Current Account Deficit (CAD) progressively contracting from US$ 88.2 billion (4.8 per cent of GDP) in 2012-13 to US$ 22.2 billion (1.1 per cent of GDP) in 2015-16. On a cumulative basis, the CAD narrowed to 0.7 per cent of GDP in April-December 2016 from 1.4 per cent in the corresponding period of 2015-16 on the back of the contraction in the trade deficit. Foreign Exchange Reserves touched an all-time high level of US$ 371.9 billion in end-September 2016. The current position is at a comfortable level to cushion the exchange rate volatility from any international macroeconomic uncertainty. A Monetary Policy Framework Agreement between the Government and the Reserve Bank of India (RBI) was signed on 20.2.2015, providing for flexible inflation targeting. With a view to maintaining price stability, while keeping in mind the objective of growth, the Reserve Bank of India Act, 1934 (RBI Act) has been amended by the Finance Act, 2016, to provide for a statutory and institutionalised framework for a Monetary Policy Committee (MPC). Task Force for creating a sector-neutral Financial Redress Agency (FRA) as announced in Budget Speech 2015-16 that was set up on 5.6.2015 submitted its report on 30.6.2016. The Forward Markets Commission has been merged with Securities and Exchange Board of India (SEBI) with effect from 28.9.2015 to achieve convergence of regulations of securities market and commodity derivatives market. 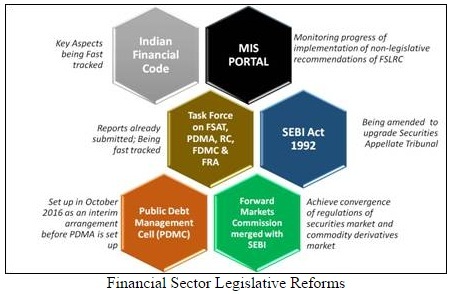 Key aspects of the Indian Financial Code (IFC) are being fast tracked. Government has set up a Public Debt Management Cell (PDMC) on 6th October, 2016, as an interim arrangement before setting up of a full-fledged independent and statutory debt management body, namely, Public Debt Management Agency (PDMA) of India. Aggressive steps were taken against the menace of Black Money. The period 2014-17 saw unprecedented enforcement actions in Direct and Indirect Taxes. A total of 23,064 searches and surveys have been conducted detecting more than Rs. 1.37 lakh crore of tax evasion.The Enforcement Directorate (ED) intensified its Anti Money Laundering (AML) actions by registering 519 cases attaching properties worth Rs. 14,933 crore. During the last three financial years (2013-14 to 2015-16), IT investigations led to detection of more than 1155 shell entities involving non-genuine transactions of more than Rs. 13,300 crore. 5.68 lakh new cases identified for e-verification process. One Time Compliance Window: There was a one-time compliance window of 3 months providing an opportunity to taxpayers to make declarations of their undisclosed foreign assets. 648 declarants filed declarations upto 30.09.2015 disclosing undisclosed foreign assets worth Rs. 4164 crores. An amount of about Rs. 2476 crore has been collected as tax and penalty in such cases. In order to curb the flow of black money stashed abroad, the Black Money (Undisclosed Foreign Income and Assets) and Imposition of Tax Act, 2015 (the Black Money Act) has been enacted. The Black Money Act has stringent provisions, which inter-alia include that an offence of willful attempt to evade tax shall be a predicate offence under the Prevention of Money Laundering Act, 2002. The Income Declaration Scheme, 2016 (the Scheme) was an important step by the Government to rein in undisclosed income & assets. The Scheme commenced on 1.6.2016 and was open for declarations up to 30.9.2016. The Scheme has been a major success as it resulted in declaration of Rs.67,382 crore by 71,726 declarants. In the wake of declaring specified bank notes as not legal tender, and in order to discourage people from finding illegal ways of converting their black money into black again, vide the Taxation Laws (second Amendment) Act, 2016, the Taxation and Investment Regime for Pradhan Mantri Garib Kalyan Yojana, 2016 (the Scheme) has been introduced. The Scheme commenced on 17.12.2016 and was open for declaration upto 31.03.2017. The Centralized Processing Center (CPC) of Income Tax Department has processed over 4.19 Cr Income Tax returns and issued over 1.62 Cr refunds till 10th February 2017. This can be compared to 4.14 Cr Income Tax returns and 1.61 Cr refunds for the full year in FY 2015-16. The amount of Refunds issued till 10thFebruary 2017 was Rs 1.42 Lakh Cr which is 41.5% higher as compared to the same period last year. Taxpayers also reposed faith in CBDT’s e-filing program by filing a whopping 4.01 Cr e-Income Tax returns in till 10thFebruary 2017 representing an increase of over 20% over the previous year. In addition, over 60.05 lakh other online forms were filed with an increase of nearly 41% compared to the previous year. The figures for indirect tax collections (Central Excise, Service Tax and Customs) up to February 2017 show that net revenue collections are at Rs 7.72 lakh crore, which is 22.2% more than the net collections for the corresponding period last year. Till February 2017, about 90.9% of the Revised Estimates (RE) of indirect taxes for Financial Year 2016-17 has been achieved. As regards Central Excise, net tax collections stood at Rs. 3.45 lakh crore during April-February, 2016-17 as compared to Rs.2.53 lakh crore during the corresponding period in the previous Financial Year, thereby registering a growth of 36.2%. Net Tax collections on account of Service Tax during April-February, 2016-17 stood at Rs. 2.21 lakh crore as compared to Rs.1.83 lakh crore during the corresponding period in the previous Financial Year, thereby registering a growth of 20.8%. Net Tax collections on account of Customs during April-February 2016-17 stood at Rs. 2.05 lakh crore as compared to Rs. 1.94 lakh crore during the same period in the previous Financial Year, thereby registering a growth of 5.2%.During February 2017, the net indirect tax grew at the rate of 8.4% compared to corresponding month last year. The growth rate in net collection for Customs, Central Excise and Service Tax was 10.9%, 7.4% and 7.6% respectively during the month of February 2017, compared to the corresponding month last year. Under Direct Benefit Transfer (DBT), an amount of Rs. 1,02,786.77 crore has been paid using Public Financial Management System (PFMS) in various programmes of Government viz. MGNREGA, NHM and food subsidy etc. till February 2017 for more effective and transparent utilisation of resources. General Financial Rules (GFRs), 2017 were released by the Union Finance Minister Shri Arun Jaitley on 7th March, 2017 to enable an improved, efficient and effective framework of fiscal management while providing the necessary flexibility to facilitate timely delivery of services. The distinction between plan and non-plan expenditure has been done away with and consequently the appraisal of non-plan expenditure through Committee of Non Plan Expenditure (CNE) has been done away with. The number of Central Sector Schemes (CSS) was brought down to 300 from around 1500 earlier, and the number of Centrally Sponsored Schemes was brought down to 28 from 66 earlier. This has enabled us to better allocate our existing resources and improve the efficiency of government programmes. 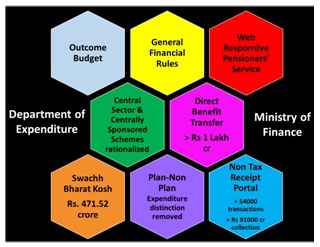 In order to ensure faster realization of Government revenue, other than Direct & Indirect Tax receipts, a Non-Tax Receipt Portal was inaugurated by the Union Finance Minister, to provide a one stop window to citizens, corporates and other users for making online payments of Non-Tax Revenue payable to Govt. of India. So far more than 54,000 transactions have been done using this portal, leading to a collection of Rs. 91,017 Crores. 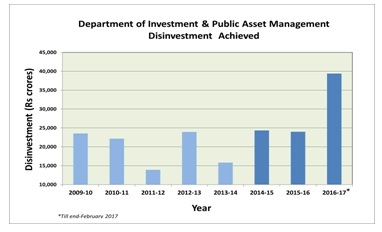 Disinvestment Performance: The total disinvestment achieved in the last three years (2014-15 to 2016-2017) was Rs. 87,714 crore as against Rs. 53,670 crore in the previous three-year period. The average yearly realization of Rs. 29,238 crores during the period between 2014-15 to 2016-17 (last 3 years) vis-à-vis Rs. 19,873 crore for the period between 2009-10 to 2013-14 (5 years) represents an increase of 47%. A system of Rolling Plan has been brought-in, replacing the earlier system of annual plans, wherein shares are readily available for transactions, to take advantage of the market conditions without any loss of time and with an element of surprise for the market players. This helps in minimizing the price hammering during disinvestment of CPSEs. Central Public Sector Enterprises (CPSE) Exchange Traded Fund (ETF): The Government launched a Further Fund Offer (FFO) of the CPSE ETF Scheme. Overall, the issue got oversubscribed by 2.30 times – Rs. 13,802 crore worth of applications were received as against the maximum issue size of Rs. 6,000 crore. The number of Retail applications was 2,70,712 (approx. 7 times the Retail applications received during first tranche held in March 2014), with corresponding value of Rs. 2,465 crore. This was one of the largest retail offering (Government / Private) in capital market in last few years. The Government realized an amount to the tune of Rs. 6000 crore through this offer. Time-bound listing of CPSEs on Stock Exchanges: DIPAM has issued circular dated 17.02.2017 on the mechanism and procedure, along with a list of activities with indicative timelines, for time bound listing of CPSEs by all the Administrative Ministries/Departments. This will enable unlocking the true value of the company and promote ‘people’s ownership’ by encouraging public participation in CPSEs, making them accountable to its shareholders. Banking Regulation (Amendment) Ordinance, 2017: The promulgation of Banking Regulation (Amendment) Ordinance, 2017 will lead to effective resolution of stressed assets, particularly in consortium or multiple banking arrangements. The Ordinance enables the Union Government to authorize the Reserve Bank of India (RBI) to direct banking companies to resolve specific stressed assets. The RBI has also been empowered to issue other directions for resolution, and appoint or approve for appointment, authorities or committees to advise banking companies for stressed asset resolution. Merger of SBI Associates with SBI: Cabinet in its meeting on 15.02.2017 has approved the proposal for merger of 5 State Bank associates with State Bank of India (SBI) and the same has been notified in the Gazette of India on 22.02.2017. This will lead to better management of high-value credit exposures common to SBI and Associate Banks, as there would be single, more focused oversight and control over cash flows of large corporate borrowing entities instead of separate and independent monitoring and more effective management of stressed or Non-Performing Assets (NPAs). The Government infused a sum of Rs. 25000 crore in 19 Public Sector Banks during financial year 2015-16. Further, With the approval of Hon’ble FM, the capital allocation plan for FY 2016-17 was finalized in which capital of Rs. 22915 crore was allocated to 13 PSBs, out of which 75 % (Rs. 16414 crore) was infused upfront. An amount of Rs. 10,000 crore has been proposed for Re-capitalization of PSBs for the Financial Year 2017-18. Pradhan Mantri Jan Dhan Yojana (PMJDY): The deposit base of PMJDY accounts has expanded over time. As on 05.04.2017, the deposit balance in PMJDY accounts was Rs. 63,971 crore in 28.23 crore accounts. The average deposit per account has more than doubled from Rs. 1,064 in March 2015 to Rs. 2,235 in March 2017. 22.14 crore RuPay cards have been issued under PMJDY. The average number of transactions per Bank Mitra, on the Aadhaar Enabled Payment System operated by Bank Mitras, has risen by over eightyfold, from 52 transactions in 2014-15 to 4,291 transactions in 2016-17. Pradhan Mantri Jeevan Jyoti Bima Yojana (PMJJBY): As on 29th March, 2017, Cumulative Gross enrolment reported by Banks subject to verification of eligibility, etc. is over 3.09 Crore under PMJJBY. A total of 62006 Claims were registered under PMJJBY of which 58805 have been disbursed. Pradhan Mantri Suraksha Bima Yojana (PMSBY): As on 29th March, 2017, Cumulative Gross enrolment reported by Banks subject to verification of eligibility, etc. is over 9.94 Crore under PMSBY. A total of 12488 Claims were registered under PMSBY of which 9364 have been disbursed. Atal Pension Yojana (APY): As on 21st March, 2017, a total of 46.80 lakh subscribers have been enrolled under APY with a total pension wealth of Rs. 1713.214 crores. Pradhan Mantri Mudra Yojana: As per latest data, loans extended under the Pradhan Mantri Mudra Yojana (PMMY) during 2016-17 have crossed the target of Rs. 1,80,000 crore for 2016-17. Sanctions currently stand at Rs. 1,80,528 crore. Of this amount, about Rs. 1,23,000 crore was lent by banks while non-banking institutions lent about Rs. 57,000 crore. Data compiled so far indicates that the number of borrowers this year were about 4 crore, of which over 70% were women borrowers. About 18% of the borrowers were from the Scheduled Caste Category, 4.5% from the Scheduled Tribe Category, while Other Backward Classes accounted for almost 34% of the borrowers. Stand-Up India Scheme: As on 11th April, 2017, Rs 5807.7 crore has been sanctioned in 28444 accounts. Of these, women hold 22708 accounts with sanctioned loan of Rs 4740.11 crore, Scheduled Caste persons hold 4487 accounts with sanctioned amount of Rs 825.17 crore while Scheduled Tribe persons hold 1249 accounts with a sanctioned amount of Rs. 242.43 crore.